Ananka's Diary: A Giant Blob is Threatening Alaska! it's the end of the world!!!! Ewwww. I have got to start being prepared after cute posts. Anyways, this is sinisterly like something in a very disturbing and very good book I read ... The Tomorrow Code, by Brian Falkner. I mean, just really awesome! When you get the close up photo, you can tell that it's algae, but from afar, It's just a 12 mile long movie cliché! A blob that's alive? Maybe something similar to Maximum Ride 5? They said it wasn't oil, but I wonder if it could be used for a fuel source. Hmmm . . . IT'S A MUTANT FORM OF ALGAE!!!!!!!!!!!!!!!!!!!!!!!!!!!!!!!!!!!!!!!!!!!!!!!!!!!!!!!!!!!!!!!! Filamentous is a fun word. even if is my doom, it is AWESOME!!!!!! Ooops...I guess I should have listened when my biochemistry teacher said not to always tip my experiments down the sink. ALGAE IS NOT A PLANT!!!!!!!!!!!!!!! It's a protazoan, in the same kingdom as amoebas and all single-celled organisms that are Not Bacteria or Archaebacteria. it does kinda sound like those things from maximum ride 5, only instead of freaky yet misunderstood mutant whales, this is a giant blob of something. like the whales in max 5, this thing could be the nasty mixture of pollution and toxic waste and all the other ineluctable problems that are destroying our ozone layer. this blob could be mother nature's way of getting revenge on the human race! u were right Lioness. IT'S ALIIVE!!!!!! Peacey & Kitty: Can I come too? 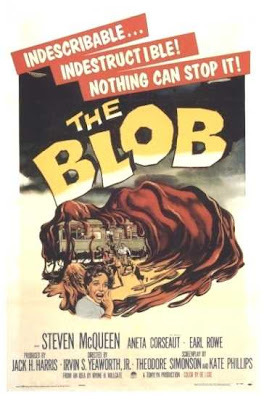 COINCIDENCE ALERT: OMG weird i am watching THE BLOB right now!